Widget Droid: The 25 Top Essentials..
My Note II has become an integral part of my life. I can't even imagine life without it. And even the smaller Galaxy screens seem too tiny for me, now. But I wouldn't want to carry around anything bigger in my cargo pants. I have also noticed that I tend to hit the right keys more often, even though I have big hands with big fat fingers and I'm not particularly coordinated with the finger action, either (all my friends beat Me when we are gaming). 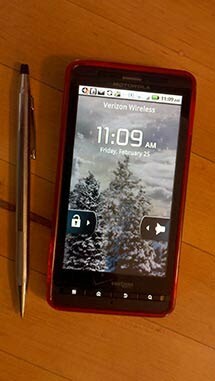 My wife's Droid X has sold for $75.00 on Swappa (http://swappa.com/listing/EDK018/view), but I cannot force myself to sell mine, yet. I became kind of attached to my Droid X over the two year carrier contract. Even though the battery on my Note II goes all day long, usually no matter how much I use it, it is often really low when I take off to go to work and I leave it plugged-in at home to charge while working (because I don't want to bring the charger and lose it). But I do grab the old Droid X so that I can browse and check email, etc., on breaks. I almost don't mind that I can't use it as a phone anymore (the Note uses that number & phone plan, now) because I'm not allowed to have a phone on me at work. What are my favorite apps? Writing this blog entry I have come to find out that is quite a long list. Some of the essentials are actually already there, the Samsung Camera is astounding when compared to My old Droid X. But I see that 41 mega pixel camera that the Nokia Windows has and I wonder why the android didn't do that. I always thought the Windows phone killer app would be that they would allow bullet-proof Virtual Private Network (VPN) access to your Windows desktop/laptop computers screens & files. But No, they finally addressed the camera issues. I might just grab one of these when I upgrade my business cell, now. Still, my Note II comes with some great photo tools and the quad processor (and decent memory) allows Me to run virtually anything I want, even doing a couple of things at once (like checking My already downloaded email while on hold). These androids are great tools compared to the old smartphones of yesteryear, though. Yes, I do mean the single processor Droids... any single processor "smart" phone. And yet, there are fantastic apps that are a part of the OS itself that those antique models share. The stock Gallery on either device is absolutely killer, for instance. You cannot find many competitors to that one. But that is a part of the android experience. What apps would I recommend a user have? Some of my favorite essential android apps are the same as when I had the Droid X, only updated since then. And they run much faster on the quad processor enhanced Note II, as well. But they open up the device to real usefulness by allowing it to become more of a tool. By far, I use Kuffs Password Safe Pro the most and rely on it the heaviest. With all the passwords I have to remember, and the security I have to maintain, Password Safe Pro is an absolute life saver. Lookout keeps the Note II secure, as well. I had tried another anti-virus/anti-malware program for portable devices, but this one stays free without bugging the hell out of Me. Gotta like that. It would seem so obvious to many that having the Play store on your device is a give, but there was a time when I had a tablet that wouldn't run it and I really, really, really missed it. I don't even use that tablet anymore. Anyone want a used tablet for free? PayPal... as a web designer I would not be able to function without PayPal. I do wish the mobile app would support more than one PayPal account, though. I have a business account so that I can accept credit card payments, but I also need my free personal account so that PayPal doesn't double charge and take a fee out of My reseller commissions. Amazon Mobile ...If ever you need something for your mobile device, a charger, etc... check out Amazon.com . They offer the lowest prices on device gear and necessities. To have the whole Amazon store on your device and giving the very best prices on device accessories, makes the Amazon Mobile app a shoe-in. If you have a larger tablet, get that version for better display support (I have a couple of android tablets, as well). Dropbox!!! I cannot emphasize enough how valuable this app is. Many device and PC apps support the cloud now, and it seems that they all start supporting Dropbox first. This is a good idea, as they offer a great free Dropbox account to get you started. It isn't that they are the only game in town, but they are one of the best with ways to upgrade your account for free, including linking your Facebook account to more easily share folders with friends on Fb and more. SkyDrive is also a staple, this cloud service is a part of the Microsoft network and allows Live or Hotmail to be and do much more, from your phone. Cool. Plus, as with Dropbox & Drive, SkyDrive is supported by most software that supports the cloud. Wifi Analyzer is a great tool, especially when trouble shooting connectivity problems with your local network. Fing is a great network monitor and toolbox for checking your LAN and viewing who is connected. For bigger issues with network providers, Speed Test is an essential app, and can also verify that your network provider really is all that they say they are. Elixr is probably the best and most complete little monitor and toolbox. But it does seem to have an interface that is sort-of hard to get aquainted with, with non-standard icons/buttons. But some other apps won't do all it does, either. System Tuner also offers lots of neat monitors and tweaks. One of the best android tweakers is Spare Parts+, it really allows you to set a great deal of things you can't using any other app. Without a doubt, you cannot go wrong with ES File Explorer. This is a very powerful tool that allows you the flexibility you need to find exactly what you are looking for, and makes an awesome file manager. I also like Android Sensor Box, because it is easier to use than some of the other apps that do absolutely everything, when you just want to check or monitor your sensors. Sometimes programs will have memory leaks on any computerized device when they aren't written well enough. I use Memory Booster to manage my memory and currently running apps. When I think that something may be slowing down the system, I might tap My Advanced Task Killer so that I can manually kill any non-essential apps that I don't need and haven't assigned an exception. Polaris Office is My go-to office app, and it came with My Note II. But I also have OfficeSuite Pro from when I registered it on My old Droid X. Either of these is really good. I really love CamCard, because I can easily take a photo of someone's business card with it and it will magically turn it into a contact. S Note is vital for playing with the stylus. Not that I do it a lot, but as an artist I love that I can play with graphics and do kooky handwritten stuff with My phone. This app also came stock with the Note II. Alarm Clock Extreme Pro is my only and absolutely essential alarm clock. In fact, without this device running Alarm Clock Extreme Pro, I would be late all the time. But now it's a very rare occassion. Even then, its only because I didn't set the alarm! I also upgraded it with the Timer. Chrome. Sure, you can use any browser, but Chrome is working flawlessly with My laptop, saving my bookmarks (favorites) and filling in the info I let it have when I come to forms. It just plain works right. I want to say Gmail, but gmail comes with every android phone because android is a Google product. I want to say the GPS, but again, that is standard equipment, here. I want to say the Camera or the Gallery, but I've already knocked them off the list as well. But there is another little gem I've been missing... the All In One Toolbox. Try it, you'll like it! I haven't even touched on the camera apps, image processing or video editing tools. I'm not even speaking about books or MP3 & sound software. But I think that would be a great start for anyone wanting to put the right applications on their device to enable it to be more of a use, more of an indispensable tool.